Incredible modeling performance produces results in seconds. 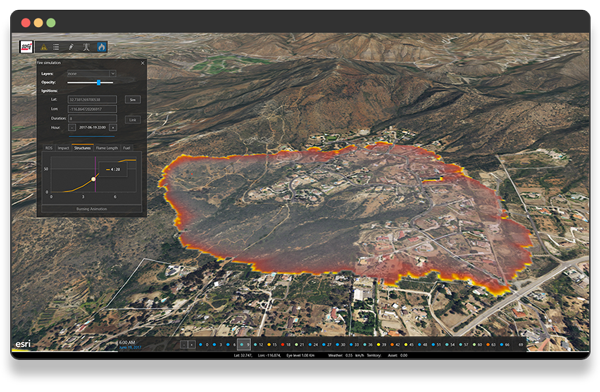 Wildfire Analyst was designed to be used with a laptop or tablet at the ICP, at the Operations Center, or on-scene, providing outputs in less than a minute. 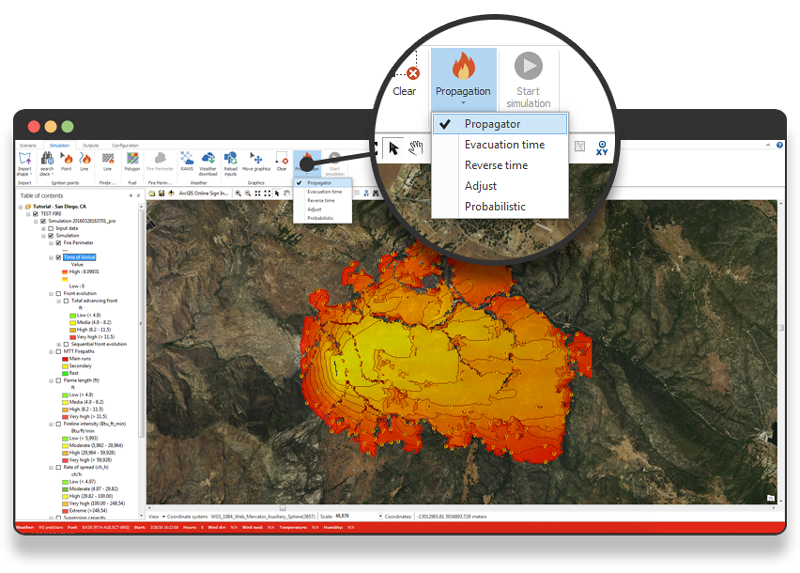 The software can use predefined weather scenarios, or current and forecasted weather, to model fire behavior and provide outputs within seconds, delivering results efficiently and intuitively in 3-D and 4-D applications. An extensive suite of outputs with powerful user tools. 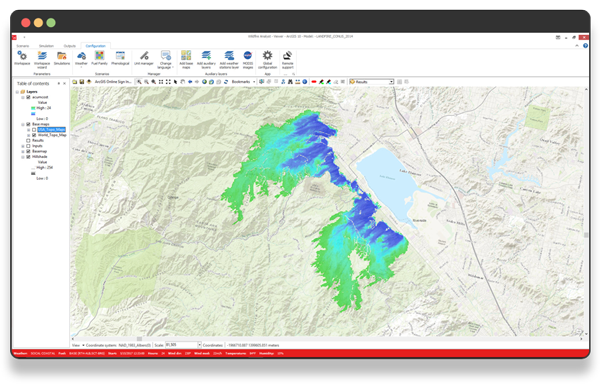 Wildfire Analyst provides a comprehensive set of outputs and tools for each simulation that is tied directly to the time stamp of the weather conditions and data inputs for an incident. 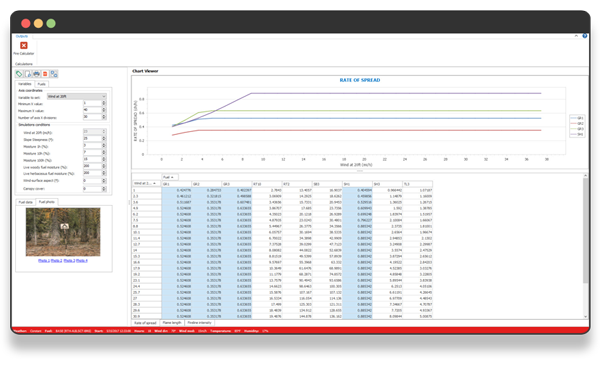 The real time performance allows you to create multiple simulations for an incident, easily and quickly, reflecting changing conditions and response tactics during the incident lifecycle. Our different simulation modes provide tools for different purposes, extending the range of fire behavior analysis to not only active incident response and initial attack. 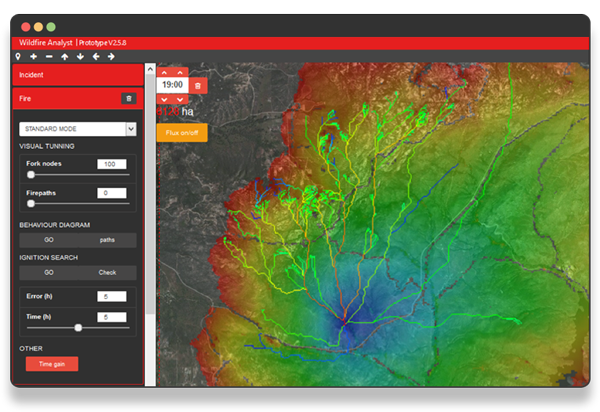 These tools support other wildfire related activities, such as prescribed burn planning, post-fire analysis and investigation, and risk assessment. 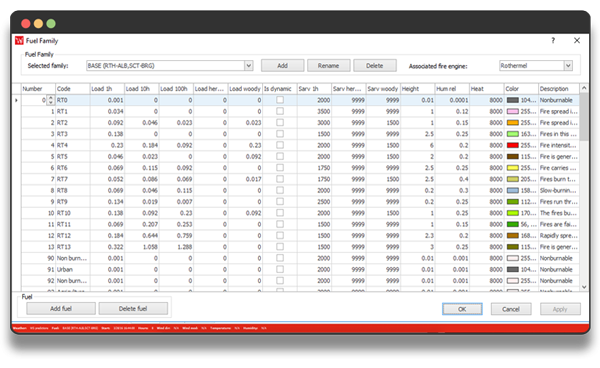 Selecting the appropriate simulation mode is simple with Wildfire Analyst. Advanced Tools With Simple Interfaces At Your Fingertips. A full suite of tools to manage simulation scenarios. Simulations are parameterized within scenarios. Additional tools are provided to analyze weather and fire behavior outputs. Data and technology integration is easily configured and managed. Advanced analysis tools for the seasoned FBAN. The analysis of fuels data, weather data and fire behavior outputs requires an advanced suite of tools that allow the experienced FBAN to interrogate and calibrate data to best reflect observed and expected fire conditions. These tools allow you to leverage your knowledge and experience with robust fire science through intuitive and effective user interfaces. Integration with a variety of data services, and third part software is vital to making these tools and options available. Check out WFA’s Seamless integration capabilities for more information. Hourly fire perimeters and time of arrival outputs are key information to aid the Incident Command Team in assessing where the fire will spread, where resources should be positioned, and who is at immediate risk. Seamless integration of values-at-risk data provides impact analysis summaries immediately, such as structures threatened by hour. Identifying the minimal travel time and critical fire paths is key information that can inform tactics for resource placement and suppression. The ability to target these paths can greatly reduce the spread of a wildfire, and minimize firefighter exposure. A suite of different simulation modes is available to support different needs and objectives. Conventional fire spread simulations to derive fire plans representing time of arrival. Reverse time simulation using final fire perimeters to calculate likely source ignition locations. 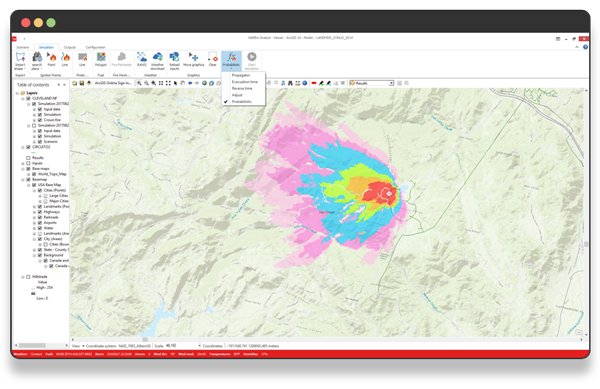 Evacuation time simulation to derive firesheds that identify those locations most at risk during specific weather conditions, representing how long it will take a fire to reach critical assets and values-at-risk. Probabilistic mode for analysis of fire threat and burn probability allowing for thousands of simulations for a given location, ideal for risk assessment. Adjustment mode that integrates field observations of fire progression to adjust rates of spread factors that teaches the simulation engine to more accurately match expected spread of the fire. This is achieved in seconds.